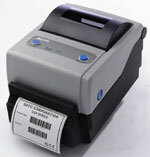 The SATO CG408 is categorized under the "Compact Series" in the SATO product lineup. Its ease-of-use, ultra-compact form factor, 32-bit RISC CPU, 100mm per second print speed and 4MB Flash memory makes it suitable for on-demand, low-volume label or wristband printing applications. 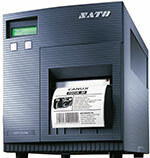 The SATO CG408 is an Entry Level 4" Thermal Transfer/Direct Thermal desktop printer that has 203 or 305dpi print resolution available. 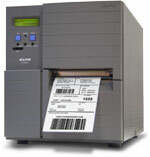 The SATO CG408 is an affordable, compact 4" thermal printing solution, designed for general-purpose barcode label applications. Ideal for batch printing applications.It can be self-powered with an optional external power module.